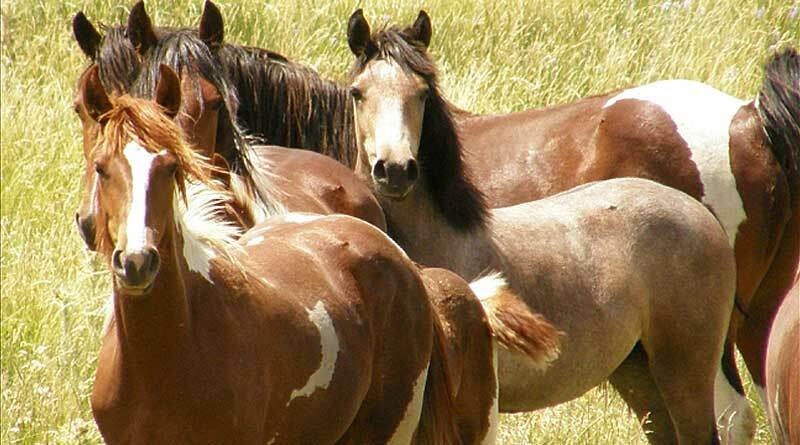 The US Senate Appropriations committee has taken steps toward protecting wild horses, in a move welcomed by advocates. The language was released as part the Fiscal Year 2018 chairmen’s recommendation and explanatory statement for the Department of the Interior, Environment, and Related Agencies. It maintains protections for wild horses and burros, and states that they cannot be killed or sold in any way that results in their destruction. The draft language would retain the status quo, meaning wild horses and burros would be protected as they have been for nearly ten years. Its position stands in contrast to that of the House Appropriations Committee. It first rejected language barring horse slaughter, then approved an amendment that advocates feared would allow thousands of healthy unadopted wild horses and burros to be sold for slaughter. The BLM has been pushing for the right to sell the animals “without limitation”, as the cost of keeping tens of thousands of wild horses gathered from the western rangelands consumes a lion’s share of the management budget. This draft bill will enable the ranking members of the House and Senate Appropriations Committees to begin negotiations on critical items within their respective bills to determine what will end up in the final draft, including whether or not the killing of wild horses or burros will be allowed. The advocacy group Return to Freedom Wild Horse Conservation applauded the Senate Appropriations Committee position. It said the committee had heard the voices of the American people and had produced a Fiscal Year 2018 Interior Appropriations bill that continued to bar the BLM from killing healthy unadopted wild horses and burros. Some members of Congress have called for the BLM to “euthanize” — shoot — wild horses as a way to remove them from the public lands. “To do so would betray decades of taxpayer support for the protection of our wild horses and ignores the deep historic and cultural connection Americans have for wild horses and burros,” the nonprofit group said. Another advocacy group, The Cloud Foundation, also welcomed the committee’s move. “While this is only a temporary victory, we at The Cloud Foundation are extremely thankful for this good news out of the Senate,” said Lisa Friday, the group’s communications director. Its executive director, Ginger Kathrens, said: “Our work is not finished, but as we gather with our families to celebrate Thanksgiving, we at The Cloud Foundation are giving thanks not only to the Senators who stood with the wild ones, but also to the American public who spoke up loud and clear.